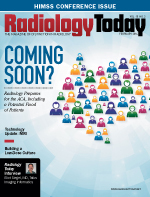 Regulatory trends, consumer expectations, and provider-payer relationships have changed considerably over the last few years, affecting not just clinical processes but radiology workflows as well. Those changes, driven in part by the Affordable Care Act, are pushing imaging organizations to become more outcomes based and value driven. These changes likely will expand the role of analytics in radiology. Both the ACR and the American Recovery and Reinvestment Act emphasize the need to include clinical decision support in imaging workflow. Also, Medicare and some private payers are moving toward providers sharing greater financial risk, which will prompt imaging organizations to monitor and improve their performance across both quality of care and consumer engagement metrics. With advancements in the aggregation of radiology data through vendor-neutral archives, RIS/PACS integration with EHRs, and medical image exchanges, there now is an opportunity for radiologists and referring physicians to leverage analytics and reporting tools to address many of the challenges associated with performance measurements. • Improving point-of-care decision support: Physicians typically do not have access to a patient’s history of radiology data, limiting their ability to analyze past information while making a diagnosis. Integrated clinical and imaging data go a long way in increasing the effectiveness of clinical decisions at the point of care. This point also is covered in stage 2 meaningful use, requiring 10% of imaging results to be made accessible through EMRs. With the threshold expected to increase in the future, a significant amount of imaging data, such as radiology reports, likely will become part of clinical systems. • Enhancements to drug efficacy: With the use of analytics, providers can draw insights and correlations from vast amounts of radiological data. In the case of clinical trials, analytics can help determine the drug efficacy and treatment effectiveness being provided as well as determine any gaps in care, allowing physicians to make necessary changes when needed. For example, by analyzing tumor data in oncology, physicians can assess the impact of certain drugs for a specified population. • Radiation dose management: Analytics can help physicians track a patient’s history of radiation dosage, covering the type of scan, body part, machine, location, date, etc. At an individual level, being able to identify trends or patterns in a patient’s prior medical history helps referring physicians avoid repeat scans or reduce the number of needed scans. At the population level, analytics can help clinical decision makers compare various studies, analyze variations in radiation doses for similar conditions, and reduce doses. This level of insight allows clinicians and radiologists to make necessary amendments to imaging protocols, potentially lowering the overall cost of care and minimizing patients’ exposure to ionizing radiation. • Utilization of imaging resources: Health systems that leverage analytics tools can monitor ordering patterns and equipment utilization. Especially in multisite practices, this allows appointment schedulers to direct patients to facilities with lower utilization, thus reducing patient wait times. Analytics helps optimize the utilization of radiology personnel such as neuroradiologists or other subspecialists by tracking available bandwidth, time between cases, productivity, and staffing requirements. • Linking radiologist performance to outcomes: Tracking radiologists’ performance is inherently subjective. In the absence of peer reviews, analytics provides radiologists with an aggregated set of historical radiology data that can be used to create self-defined measures for performance tracking and improvement. Integrated with clinical data, this can become a tool to map radiologists’ performance to clinical outcomes and identify potential areas of improvement. • Improvements in the radiology workflow: Using analytics, imaging practices can derive actionable insights from a large amount of operational data. Operational teams can examine patterns based on type of study, technologist, radiologist, or machine as well as make accurate estimates of time spent at each step of an exam. Radiology departments can use this kind of data to make improvements in the radiology workflow. For example, management can look at order data to identify days with higher turnouts and then rotate schedulers to maximize turnaround for those days. While the opportunity for utilizing analytics in radiology is significant, many solutions available today haven’t been designed with structured clinical data in mind and have a limited ability to manage unstructured data, such as many radiology reports, that are saved in multiple standards and formats. The lack of standardized procedure codes across organizations makes the challenge greater, significantly limiting clinicians’ ability to interpret imaging information across disparate facilities. Identifying the analytics tools that work best for individual stakeholders and training staff to use advanced analytics tools correctly requires significant effort. Over time, as many of the challenges around data standards and interoperability are addressed, we can expect analytics to be a critical component of the radiology workflow, enabling radiologists, referring physicians, and hospitals to make earlier and more accurate diagnoses, reduce patient radiation exposure, and manage imaging resources utilization. Seeing the rate at which both the provider and health care analytics vendor market is evolving, that day may be closer than we think. — Amit Dedhia and Shujah Das Gupta are senior consultants for the medical imaging practice at CitiusTech, a health care IT provider.